This sign was among many along Waikiki's beach yesterday warning people to stay out of the sewage-polluted water. OAHU'S world-famous stretch of beach sparkled under the sun yesterday, and warning signs and contamination could not keep some visitors out of Waikiki's waters. The warning signs were expected to stay up today, even as state and city officials say the latest results show that bacterial counts are going down -- but not far enough to declare the area safe for swimming. "We're not going to go out and say the waters are safe, but it looks like it's getting there," said Kurt Tsue, spokesman for the state Department of Health. "As far as safety, we can't say for sure where it is safe, especially with the heavy rains." For now, officials are telling the public to stay out of the water because of sewage spills and runoff from the recent rains. 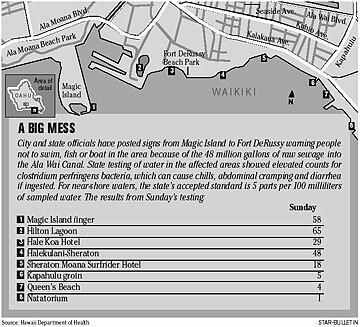 Water samples taken Sunday showed overall diminishing levels of bacteria at most of the 12 sites tested along the Waikiki coast, according to test results released by the city. Tsue said that officials are optimistic that the numbers will continue to go down because of the expectation that yesterday's sunny weather would further kill the bacteria. Water currents also are helping. "We're optimistic, too, absolutely," city spokesman Mark Matsunaga said. A stretch of beach between the Hale Koa Hotel and the Sheraton Moana Surfrider Hotel was closed Sunday because of high levels of bacteria in the water following sewage spills. There were already warning signs posted at Duke Kahanamoku and Fort DeRussy beaches as well as Magic Island Lagoon and Ala Moana Bowls after 48 million gallons of waste water was dumped into the Ala Wai Canal after a 42-inch main break last month. City officials said bacterial counts were steadily going down through Friday, when heavy rains again washed more contaminants and debris into the Ala Wai Canal and the ocean. It takes 24 hours for the city to get results back from the state laboratory that tests the samples. Samples taken yesterday will not be known until today. 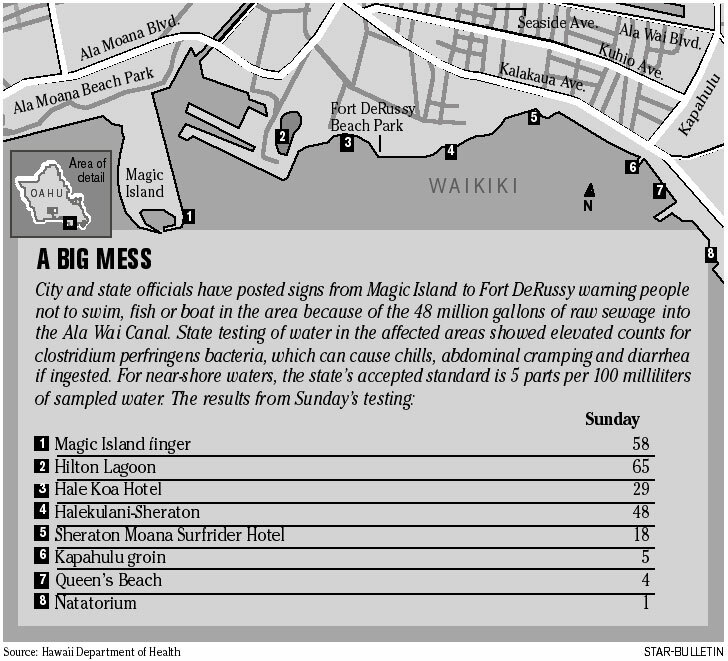 Despite warning signs posted in English and Japanese on the shoreline between the Hilton Hawaiian Village and Sheraton Moana Surfrider Hotel in Waikiki, some tourists still played in the contaminated water. Some were observed swimming off of the Sheraton Moana Surfrider with their young children. More than a dozen surfers were also catching waves at a surf spot called Canoes. Waikiki resident Maria Ringblom said she only goes chest high in the water. "I wouldn't put my whole head in the water," Ringblom said, gesturing at a swimmer who dunked her face in waters off of the Royal Hawaiian Hotel. "At least it's not raining," she said. 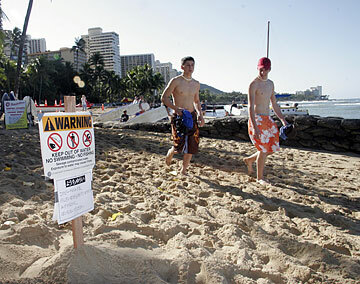 Waikiki lifeguard Garvin Freitas said the south swell coupled with winds is moving the contaminated waters out to sea. "It looks better than (Sunday)," Freitas said. On Sunday, lifeguards watched a brown plume of water move toward the shoreline. Many beachgoers opted to remain onshore. "I'm not going into the water," Indianapolis resident Cara Magnabosco said. The 17-year-old, who was strolling along the Waikiki shoreline, said her Oahu relatives told her about the sewage in the water. "It's kind of hard to come and not be able to go to the beach," she said. "At least the weather is nice." Yesterday, an official with the city Department of Environmental Services walked along the shoreline informing beachgoers of the water condition. "It's a drag," Atlanta resident Brian Boles said as he stood with his four sons, ages 7 to 13, watching the water. "It keeps us out of the water. It is what it is." But the Boleses did not let conditions affect their vacation. "We worked our way around the dirty water," said Boles' son Alec, 11. Boles said they still planned to take a catamaran ride in Waikiki.